Combine the avocado, tomato, mango, onion, lime juice, cilantro, and about a third of the salt in a bowl. Heat the oil in a large nonstick skillet over medium-high heat. Sprinkle the salmon with the remaining salt and pepper. Add to the skillet, skin side up and cook until nicely browned, about 4 minutes. Turn and cook until skin is crisp and the salmon is still slightly translucent in the center, about 4 minutes longer. 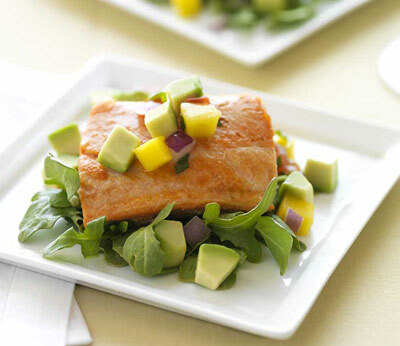 Spoon the avocado mixture over the salmon and serve.